Artist's illustration of NASA's GEMS X-ray observatory intended to study black holes and neutron stars. NASA is canceling all work on a new space telescope designed to seek out black holes and other cosmic mysteries through X-ray light due to soaring development costs, the space agency announced today (June 7). The mission, called Gravity and Extreme Magnetism Small Explorer (GEMS), was running significantly over budget, said Paul Hertz, director of NASA's Astrophysics Division, during a phone call to reporters today. "The GEMS project was initiated under a very well-defined cost cap," Hertz said. "As they approached their confirmation review, it was clear they would not be able to complete it within their cost cap. NASA made the very difficult decision not to confirm GEMS into the implementation phase." The project was selected as a "small explorer" class mission, with a firm cost limit of $105 million, not including the price of launching the spacecraft. NASA recently commissioned an independent review of GEMS' budget, and found that the ultimate price tag for the spacecraft was likely to be 20 to 30 percent over budget. Because of the cost overrun, NASA decided to pull the plug on GEMS last month. On June 5, the GEMS team, led by principal investigator Jean Swank of the agency's Goddard Space Flight Center in Greenbelt, Md., appealed the decision and submitted documents to show they had identified new areas of cost savings. However, NASA was not swayed. The space agency will now have to pay an estimated $13 million in close-out costs to cancel the mission, including contract cancelation fees to Orbital Sciences Corp. and other companies that were hired to built the spacecraft. GEMS was to use three telescopes to capture the bent X-ray light from extremely dense objects such as black holes, neutron stars and stellar remnants. The mission would have launched no earlier than 2014 and lasted two years. 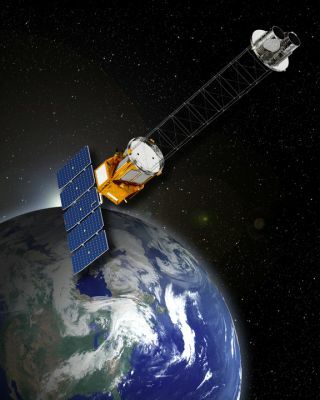 "Although there aren't any other projects in the queue right now to measure polarized X-ray sources, there are a number of observatories which can address the science questions from different areas," including NASA's NuSTAR space mission, due to launch June 13, Hertz said. The main factor behind the cost overrun was the trickiness of developing the technology needed for the mission, he said. "The instrument technology was more difficult and took longer than they had originally estimated," Hertz said. "That delayed their ability to get started on the rest of their schedule."